A&EMark Adger, chief jailer at Fulton County Jail in Atlanta. Inmates at Fulton County Jail in Atlanta go to extreme lengths to coordinate crimes with people on the outside. 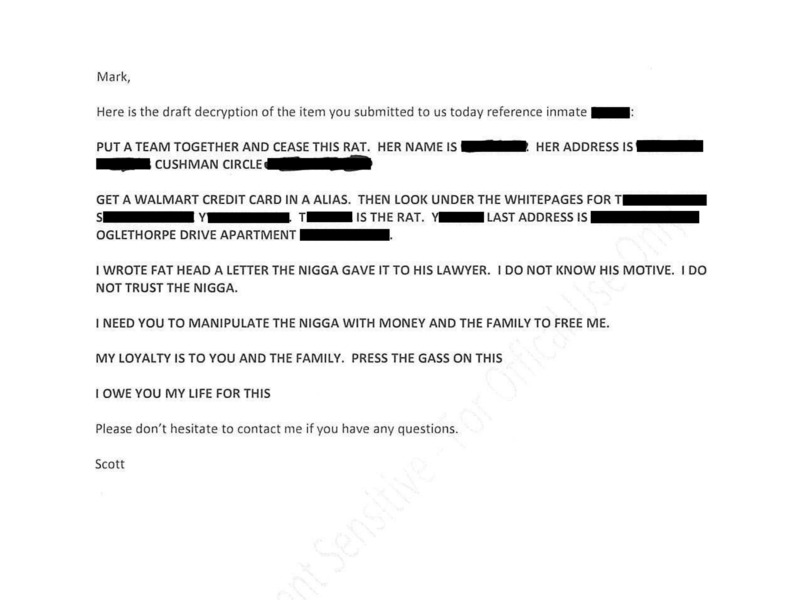 Last year, jail staff intercepted a letter written in secret code orchestrating the murder of a staff member. The jail provided Business Insider with a copy of the decoded letter. At Fulton County Jail in Atlanta, Georgia, guards are under the constant threat of violence – both inside the jail and outside. Inmates have been known to coordinate crimes with people outside the jail through a variety of methods, including illegally obtained cell phones and written correspondences containing elaborate codes. Last year, that practice was taken to the extreme, and nearly resulted in deadly consequences. Chief jailer Col. Mark Adger told Business Insider that in September 2017, the jail intercepted a letter from an inmate that looked innocuous at first glance, but was actually encrypted with secret instructions for the recipient to murder a staff member at the jail. 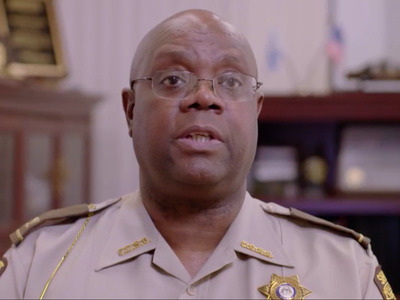 The incident took place after the filming of “60 Days In,” an A&E documentary series that takes place at the jail. Adger provided Business Insider with a copy of the original letter. “If you read the letter and didn’t know it was encrypted, you would think it was a standard, regular, ‘how you doin,’ ‘my day is fine’ kind of letter,” Adger told Business Insider. 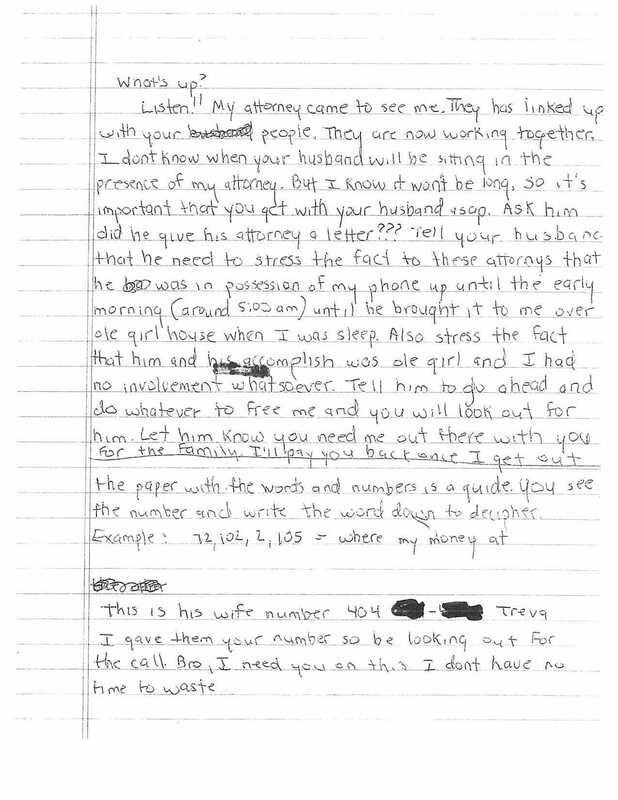 The inmate who sent the letter, whose name has been redacted, was in Fulton County Jail on charges that included murder, armed robbery, and aggravated assault with a deadly weapon. 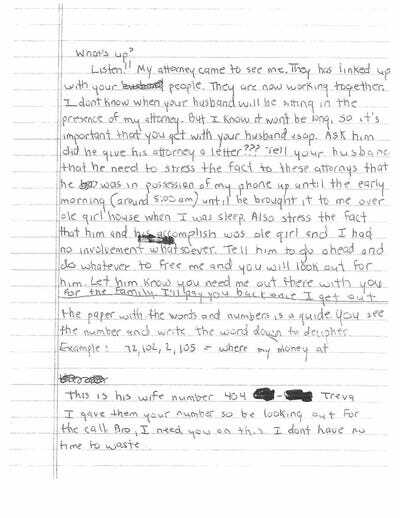 Because of the inmate’s known affiliations to an organised gang – 20% of the jail’s roughly 2,500 inmates are in gangs – Adger thought the letter deserved a closer look. He sent the letter to a cryptanalysis expert at what he called “a three-letter organisation,” and got back the decoded message within the hour. 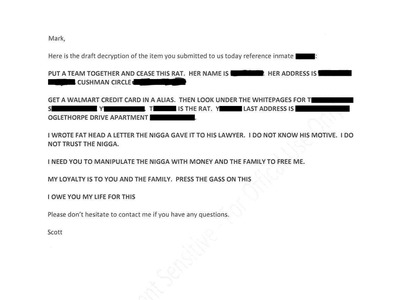 The seemingly innocent letter was actually an orchestrated hit on one of his employees. The decoded message left Adger stunned. “When I got the decryption back, and I compared it to the plain text correspondence, I said, ‘How in the hell did they get this from this? '” Adger told Business Insider. After Adger caught wind of the plot, he placed the inmate on 23-hour-a-day lockdown, referred him to the jail’s gang task force, and alerted the prosecutor working on his case. Breaking criminal codes is the specialty of the Federal Bureau of Investigation’s Cryptanalysis and Racketeering Records Unit. Ciphers devised by inmates can be highly complex, and can employ patterns of word arrangement, specific code words, and numerology. It is standard practice at Fulton County Jail to inspect mail sent and received by inmates, with the most scrutiny going toward inmates on the watch list, Adger said. His staff aren’t allowed to read legal correspondences because of attorney-client privilege, but inmates are still required to open legal letters in front of guards to ensure they don’t contain contraband. The only type of mail inmates are allowed to receive are postcards with metered stamps – adhesive stamps could be used to conceal traces of prescription drugs, as officials at a North Carolina jail discovered in 2014. Such extreme measures are necessary to prevent incidents like the one last year, Adger said.